Brett, I believe I have removed all references to my blog from TT. If I missed any please let me know. Brett, dude, we need an edit function LOL! Jim F, believe me I will do anything I can to help. Okay first of all I in preparation for my learner's permit I studied the Trucking Truth training series high road I think it's called. I did that and I used like three or four apps on my phone and also used the state booklet. In hindsight I would have dumped everything except Trucking Truths High Road Series training program, it is by far the best and it's all you need. My advice is focus heavily on hours of service but avoid split Sleeper Berth at all cost because it will only confuse you. After you've been doing it for you know a few months or something maybe but I've actually already been told by my driver leader, two dispatchers and a training coordinator to stay the hell away from split Sleeper Berth until I've got six months under my belt. Okay now having said all that, about the academy: just remember that the instructors are people. On day one we got an assignment that had basically an assignment handwritten on another sheet that was kind of like a quiz sheet and the assignment was to write "I will get out and look every time" on the back of the test sheet 25 x. Most people didn't even see that and failed that assignment so I guess my advice there is pay attention to everything. Apply your work ethic. It's the most important thing, the most important advice I can give you is pay attention, read everything, study hard and apply your work ethic. Get started on your pre-trip immediately day one, in fact start right now before you even get there, you're months away, perfect. Start on your pre-trip especially focusing on the in cab and the brake tests. The air system and brake test are critical and most people in my class didn't even start studying it until like 2 days before the the test so get on that immediately. Also avoid the social bull**** you're going to run across. This is not high school where you have to be in the the right clicque. This is the beginning of the longest job interview of your life. Treat it as such. Be serious. Be focused. Apply yourself. Also I would definitely recommend going home on the weekend since you only live a couple hours away. Oh by the way Riggins is beautiful I love it. I've actually held a heavy load a paper through there a few weeks ago. Yeah definitely the home time will definitely help clear your head but you but you do have to have you do have to spend a lot of time studying so don't take that lightly. Hey BZT, Been following your diary, congrats on your new career. I've just signed up for the Lewiston Swift Academy. Will start in Jan. I just got my learners permit and going to cram the High Road training so hopefully it will give me some breathing room at school and I can really focus on my skills training. Does that make any sense? Did you study the High Road training program on this web site? I live 2hrs south of the academy in Riggins, Idaho. Was hoping to be able to scream home on our day off and see the wifey. It depends on how my studies are going. Would love any insight you might be able to share with me about the academy and anything else you can think of from a newbies perspective. This web site is a fantastic wealth of info, but would still appreciate anything you have to offer. I don't know how I forgot probably the most important point. The Freightliner does not have that enormous lurching problem in reverse that the Kenworth has. Turn on the Traction Control and the Anti Rollback switches and it won't lurch while backing. Plus, be slow and easy on the pedal. Pack Rat thank you for the reply. I think it's pretty clear that part of the problem I had with my mentor is it he didn't know what the hell he was doing. This guy, my former mentor, has been driving trucks over the road for the same company for 11 years. He's been driving his Kenworth for about 6 months now. And he obviously doesn't even know how to drive the damn thing. My guess is I know how to use my engine, transmission, cruise control, compression brake on my Freightliner that I've been driving for one week now probably better than he does that Kenworth that he's been driving for 6 months. I know that this makes me sound like an arrogant little prick but I put up with that clown for five weeks and I didn't learn a fraction of what I should have. It's my sincere belief that this guy, my former mentor, is just milking student drivers for their miles, doing it strictly for the money. He taught me nothing at all about route planning, nothing at all about hours of service, nothing at all about how to decide whether or not I should accept a pre-plan and whether or not I could make the load in the designated time frame. Now having said all that I think it's become pretty clear that I have yet to recover from my 5 weeks of intense exposure to his toxic cynicism so I'm going to check out of this forum for a while until my attitude recovers. I again want to thank everyone that was helpful to me on these forums. The information the advice that I got here was absolutely invaluable so thanks again everyone. I'll be back once my attitude recovers. Your diary has been one of my favorite reads. Thanks for sharing... your enthusiasm is contagious. Okay first of all it's probably not fair to include Volvo in here because I only drove Volvo's at the Swift Lewiston CDL Academy. The Volvo's of the academy at the time that I was there were all manual transmissions 10 speeds and the other trucks that I've driven recently a Kenworth and a Freightliner have both been automated manuals. So it's not a fair comparison. So the Kenworth versus the Freightliner is a fair comparison however. The Kenworth is aesthetically more pleasing it's a sexier looking truck. I like the fact that the Kenworth has way better and more cup holders. The Kenworth that I drove for a month during training was a 2018 T680 Cummins and a 10-speed automated manual what some people call an automatic transmission. The fit and finish of the Kenworth and the Freightliner are pretty similar. The cupboard space in the sleeper of the Kenworth is maybe a little bit better I don't know pretty negligible difference there. The ride of the Freightliner is way better than the right of the Kenworth. The Freightliner has a 12 speed automated manual transmission and I like it way better than the automated 10 speed manual that was in the Kenworth. The jake brake on the Kenworth is stronger than the jake brake on the Freightliner but I still prefer the Freightliner. The cruise control on the Freightliner actually engages the jake brake to keep you from over-speeding on down Hills which the Kenworth does not do. That to me is a tremendous Advantage. Also I like the fact that all the cruise control buttons on the Freightliner are steering wheel-mounted where on the Kenworth they're on the center console on the dash and it's pretty inconvenient to be honest. Overall the 12-speed blows away the 10 speed. The Freightliner seems to pull Hills a lot better than the Kenworth did but I think that's probably because of the two extra gears in the transmission. The Freightliner 12 speed does skip shift in the lower gears getting off the line so that's a huge Advantage especially in traffic and in City Driving. The Kenworth does not skip shift its goes through every gear so it takes you three and a half hours to get through an intersection after a stop light. I did like the air seat in the Kenworth better than the one in the Freightliner. The Freightliner doesn't have an adjustment for the tension on the air ride so that actually does make for a little bit better comfort in the Kenworth. Although I don't remember if the Kenworth had armrests or not but I use the armrests in the Freightliner all the time now and I love them. One other thing about the Kenworth that I really did like over the Freightliner is the fender mirrors. I know some people don't like Fender mirrors but I do. I use them all the time. The fender mirrors on the Kenworth were round fisheye or convex mirrors and they were mounted farther out than the sort of square convex Fender mirrors on the Freightliner. So the Kenworth Fender Mount mirrors really allow you to see your blind spots along the side of the trailer way better than the ones on the Freightliner. So Saturday was pretty interesting. I picked up a load of breakfast cereal in Salt Lake City. The routing for this load was a little bit strange. I took the interstates up to I think Rexford Idaho and then took State highways from there up to Ennis Montana and then over to Interstate 90 near Bozeman and then from Bozeman to Billings Interstate 90 all the way. During the stretch in North Eastern Idaho just before I got into Montana I missed a turn. I realized my mistake immediately and found a very small pull out and got off the highway and got parked. I called dispatch and asked for advice. There was a loop I could have made that would have added maybe 20 or 25 miles to my trip but the dispatcher got on and started looking at maps and saw that there was another turn out a couple miles up the road that I could turn around in. To make a long story short the turnout was one of those ones it's kind of a loop off of the road kind of D shaped and I missed the first leg of it and had to kind of back into it. This was in the dark and there was snow in the turnout and stuff and anyway what should have taken less than a minute to get turned around I turned into a half hour ordeal. But: I managed to stay out of the ditches and didn't break anything, I didn't jackknife, didn't get in a wreck so it worked out. There was about a million ways that could have gone wrong and it turned out for the best. I definitely did the right thing by calling dispatch and ask him for advice because if nothing else while I got good advice but it also made me kind of slow down think it through and stuff. The dispatcher did use the tool that I wouldn't have thought to use which was basically Google Maps and satellite photo view, and there it was. Good lesson learned. Anyway instead of proceeding on to Bozeman which would have been about another hour and a half or so on two-lane highways after about twenty or Thirty miles I came across a rest area at Raynolds Pass. I spent the night there, and it's good that I did because I would have missed some really beautiful scenery in the dark and also that there's a section of that road between Raynold's Pass and Bozeman that's pretty twisty and narrow 2 lane. I would not have wanted to do that in the dark it's pretty twisty and narrow and it was bad enough in the daylight. Anyway it all worked out for the best I made it to Billings in a very casual pace today. I did some tourist Trucking, stopped and took some photos and just had a really nice relaxed day. Saved my 70 hours and the next three days are going to be a little bit intense but all good. I deliver at 5 in the morning tomorrow morning (Monday morning) and then I have to run back to Butte to get a load that I'll drop in Edwardsville, Nebraska and then turn around and get a trip back home for my first home time since before Labor Day and get the RV moved and see my beautiful wife and our fur factories. I am now out on my first solo run and it's going quite well. My truck is a 2015 Freightliner Cascadia 12 speed automatic. It's been abused a little there's some breaks in the fairings in like five or six different places but it's mechanically very sound. I'm really liking this truck. I've put about 400 miles on it so far and I'm really liking it. I like the 12-speed. It's going really well. I'm learning the things that I didn't learn during my mentorship (such as route planning, accepting loads, etc) and the support staff: the dispatchers and the load planners and the driver leaders are very very supportive. I'm learning a lot in a hurry and it's going very well. I passed my written and road tests at the swift terminal in Denver Colorado today. I feel that I made a huge mistake by sticking with this Mentor. He went right back to his same bipolar toxic cynicism after a few days. The last couple weeks have been hell. So my advice to new students would be if you have any red flags with your Mentor just request a new one don't waste your time. I got through it in spite of my mentor not because of him. I don't feel that anything I Learned was because of him at this point. I I realize that my attitude is bad about this but that's what happens when you're locked in the truck with a toxic cynic for a month. Anyway I get my tractor tomorrow morning and then I'm on my own so I just want to thank everybody on this forum again; you guys have been incredible and the advice I got was spot-on and I should have followed it a little better than I did but I hope that someone will benefit from my experience and do the right thing. Don't try to ride out a bad mentor, just get a new one. Don't waste your time, it's your time and you have to take control of it just like G-Town has said. From an outside, rookie, perspective, I think you handled it the best you could considering the circumstances. Finally standing up to your mentor I'm sure took a lot especially after his comments about how he's threatened previous students. Unless you can see the future (doubtful), there's no way of telling how it would have played out. How you approached it could have helped a lot too. Your actions may have made him a better mentor, not just for you but for many students following. On a side note, his threatening previous students could just have been his way to make sure they don't drive 3 miles down a boardwalk or forget to 'swing wide it's a trailer' moment. In any case, KUDOS to you. Thanks, My Name. My mentor is taking a couple of days hometime right now so I'm hanging out relaxing. It's nice to relax a bit. We were pushing it pretty hard, being dispatched on team loads, and we'll be back to team status Sunday morning. I was planning to study a lot but my mentor asked me to just take it easy and get rested up for another intense week. I watched a couple of movies today, walked about 5miles, and showered twice. It's funny how something like a shower is suddenly such a luxury. You did exactly as suggested; "you now own your training". Your trainer has way more respect for you and so does Swift. Well done. I feel I did the right thing. I feel that I could have done it a lot better, but at the end of the day, my training is on track, my mentor and I are seeing a lot more eye to eye, and moving forward. I feel bad that I didn't try diplomacy first, but I didn't. I'm not going to make excuses, beat myself up over it, or lose (any more) sleep over it. I think that my mentor and I are actually becoming friends now, too, so I guess everyone wins this time. After a mostly sleepless night in the top bunk in a Wal-Mart parking lot, I realized that I could have handled this situation far better than I did. Long story short: I have salvaged my relationship with my mentor, and will be completing my training with him. I was finally able to contact my driver development coordinator on the third day of trying. Once I explained my situation with my mentor, she explained my options and the consequences of exercising those options. I then asked to be assigned to a new mentor. After 5 hours or so on the road, we received a message on the QualComm to get me to a terminal, citing personal reasons. My mentor started digging at me for the reason, and after an hour or so, I finally reminded him that the first story that he shared with me was about an altercation that he got into with a previous student, during which they shared threats of physical violence, and I also pointed out that his displays of anger made me very reluctant to confront him. He agreed that those seemed like good reasons to keep it bottled up. Anyhow... I then *did* proceed to spend quite a bit of time and effort explaining that I'm not an idiot, but feel I've been treated like one by him. I pointed out that I felt I must be doing very poorly, since he had not once, in almost three weeks, mentioned a single thing I had done correctly. I pointed out that his cynicism was taking a heavy toll on me. I was polite but firm and pretty thorough. His response was surprising. He agreed with every single point and didn't argue a single one. He also spent the next 5 hours doing what he should have been doing for the last three weeks: teaching. Should I have confronted him earlier? Remember: a student driver is very isolated, and basically 100% dependant on the mentor driver. My mentor had told me about making threats of physical violence against a previous student, followed by threats of abandoning that student on the roadside. Did I handle it perfectly? Maybe not. Did I handle it in what I considered to be the safest way possible, given the circumstances? I did. Are people going to play arm chair quarterback and tell me how I should have handled it differently? Yes. They are. We picked up a load of sugar in Idaho this morning. My mentor told me that this shipper is very particular about the dry van trailer must be very clean inside, as its a food product. I swept the trailer out very well. I was on my hands and knees, prying wood splinters out of the corners with my pocket knife. I thought I had done a pretty good job. When we got to the sugar mill, their shipping supervisor inspected the trailer very thoroughly with a flashlight. Once finished with his inspection, he came out and said "You're rejected for being too clean"! Pretty high praise, I thought. My mentors response: "They're usually a lot more thorough than that. " Seriously? Not "well done". Not "good job". Later, I drove from Boise to Salt Lake City, while he slept. Then we had to get diesel and DEF. He told me to key in for DEF first, so I did. Well, this pump (which he's used hundreds of times over the last eleven years, and which I have NEVER used before), require that you pump the diesel first, so he chewed me out. For doing exactly as he told me to do. I have contacted my recruiter and my Driver Development Coordinator to begin the process of getting a new mentor. This sort of crap has been going on since Day One, but I had decided to just take it, get it over with and get on the road. I am done being treated like an idiot. 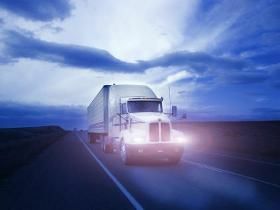 This mentor is a fantastic truck driver, no doubt about it, but teaching is simply not his forte, and I feel I'm way behind where I should be in my training. So I'm doing as I was advised by G-Town weeks ago, and owning my training. I just hope I haven't waited too long, hoping it would improve. It only got much much worse. We're in Portland waiting on a load. It's a load from a major comic book based show. I had never considered the logistics behind how big shows like this move from city to city. I don't know how many 53' trailers they're using on this show, but I've seen about a dozen, and I'm pretty sure there were more than that. Over the last couple of weeks I've seen glimpses of the back end of our consumer society that I really hadn't given much thought to, before this. I've seen four "fulfilment centers" that take up entire city blocks and a manufacturing plant far, far larger even yet. The sheer number of trucks, trailers, and people required to keep the vegetables and cans on store shelves, to keep us entertained, fed, clothed, informed, trendy goes far beyond enormous. I saw an article a few weeks ago which stated that over ten million American jobs exist in the shipping industries. I now have no trouble believing that figure. I'm going to do more research because now I'm curious about whether that number included indirect and support jobs too. MONDAY- Salt Lake City. Dropped that load, waiting on the next one. Got a much needed shower at the terminal. Going to nap for a bit. I drove in the dark in very very heavy rain last night for about two hours. Believe me out seemed like a lot more. Most of it was mountain highways so a lot of twisting turning highway. It was pretty scary and I don't mind admitting that. I get frustrated with my mentor but at the end of the day I must admit that I'm learning a *lot* from him, and he's being as patient as he knows how to be, so it's working. I'm surprised at how different it is to back a rig in The Real World, as compared to doing it in CDL school. No comparison at all. Ok. Well I've been on the road for twelve days now. I've done something like 21 backs and I have over 80 hours behind the wheel. Almost halfway. I would have been over halfway but we lost a ton of road time due to various SNAFU's. Sometimes it's best to just smile, laugh and say "aw, what the heck!" We've been running around Kentucky, Indiana and Ohio for a couple of days. We're now back in Columbus, at the terminal, trying to get that 50K mile B Service done, and the windshield replaced. We get a reminder (on the QualComm) for the B Service at least daily. It seems like three times a day, but I'm sure it's only once a day. It looks like we'll be second into the shop in the morning, so... fingers crossed. It has definitely reached the point where I'm basically overthinking EVERYthing. On a good note, my mentor gave me something that could probably be very loosely considered a compliment on my backing tonight. I'm sure it's as close as I'll get to actual positive feedback, so what the heck: I'll take it. So far, I have yet to meet or deal with a single crabby person on the road. I've seen a few but haven't had to deal with any. Every single shipping/receiving worker, forklift operator, security guard and trucker that I've dealt with have been a pleasure to deal with. I guess I'm just lucky, and I'd rather be lucky than good.